Lighting a wine bottle, or any glass object for that matter, can be a bit tricky due to the fact that the bottle will reflect everything that is in front and adjacent to it, at about 180 degrees. The most noticeable reflection will be your light source, so how do you make your lights visually appealing? Use a large light source! Unfortunately I was confined to a small, high traffic area and using large light modifiers was out of the question. I needed a device that is capable of not only making a small light source BIG, but also softens the light too. That’s when I reached for my 1- stop diffusion panel. Using a diffusion panel as a gobo (go between), would achieve the effect I required. As you can see in the photo above, a speed light was mounted on a light stand, and placed to the left of the bottle. 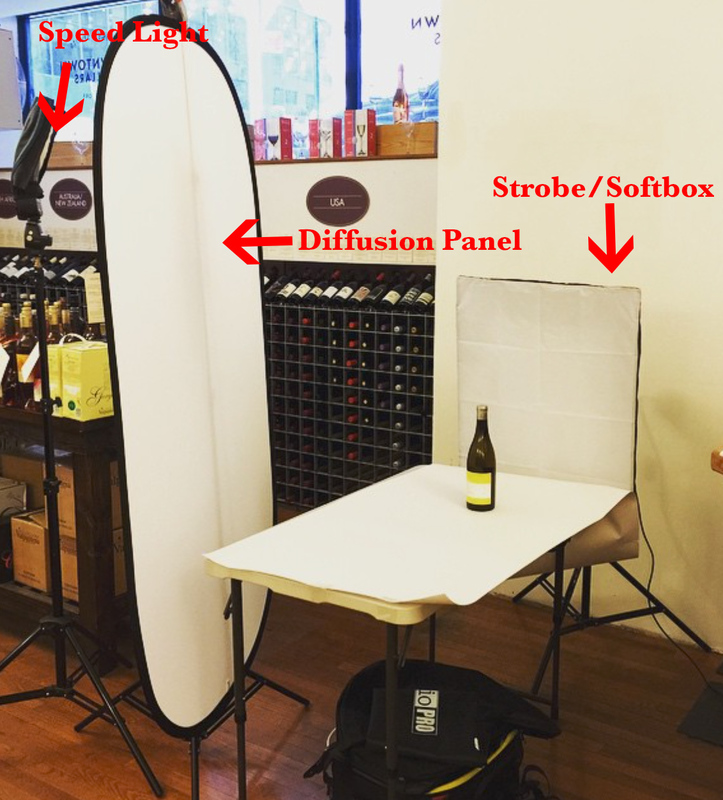 I then positioned the diffusion panel between the flash and wine bottle, making sure to keep the diffusion panel as close to the bottle as possible in order to create a larger and softer light source. Rounding out my setup, I placed a strobe/softbox combo behind the bottle, to create a completely white background. In addition to providing a white background, the light also illuminated the bottles beautifully. White seamless paper was used beneath the bottle to complete the set. Before shooting, a spike mark was drawn on the paper, so I would know where to place every bottle. Using spike marks sped up my workflow dramatically. Without the marks I would have had to position and reposition every bottle in order to match shots.